This creation I call the "red headed step child" there seems to be a big gap in 7mm whoops with 40mm propellers, maybe for good reason. This frame is pretty heavy(not sure exactly how heavy as I dont have a scale, but probably close to 13 grams if cura can be trusted), decent strength, but it is meant as more of a backup frame until you can order another frame, I get about 1.5-2 minutes of flight time with 205mah batteries. 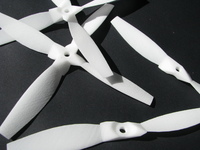 Spacing for any whoop FC. I've also released the design files for anyone who wants to modify it. If anyone can get weight down and strength up that'd be awesome! It flies great with the beecore and stock pids. I printed it in PLA with 6 walls and 2.2 outer and .3 inner walls. I havent tried the lighter version yet but I knocked about 2 or 3 grams off of it. dvr of me ragging on my .25 cent white label batteries that are way too anemic for this thing.